This article is by way of an acknowledgement of the pioneering work undertaken by Alan Frost in the field of market research. His work was undertaken before the days of the internet so we would like to take this opportunity to give Alan the recognition he deserves. This article has four authors, Ray Poynter, Elaine Bowyer, Michael Davis and Graham Croome (and special thanks to Graham for organising this tribute). Alan Frost studied psychology at Liverpool University in the late 50’s and realised that the great leaps that were being made in psychology could be applied commercially in the rapidly expanding world of market research. From the outset Alan was an innovator, applying Kelly repertory grids, cluster analysis (accessing shared time on bureaux offering computer mainframe access), and gamification approaches to attribute elicitation. I started working with Alan Frost in 1978, when he became one of the first in the UK to buy and use an Apple II computer – I continued working with Alan until he retired due to ill heath in 1989. Using those Apple II’s we developed a range of analysis programs (including cluster analysis), followed by computer aided personal interviews in 1981, and by the mid 1980s, simulated test markets based on capturing the perceptions and needs of consumers. Alan was an Apple II fan until the Apple Lisa was released, which he pioneered until the Apple Mac came on the scene, which was immediately incorporated into Alan’s passion for trying new ways to find better solutions. An understanding of what clients needed. A deep understanding of human behaviour and motivations. A great command of qual and quant research techniques. The ability to see the potential of new technology – especially when it was still at the clunky/buggy stage. When Alan was young, I hear that he was irreverent and constantly looking for new ideas, all I can say is that during our time working together Alan was the best mentor I could have wished for – and throughout the time I knew him he continued to be charming, irreverent and still constantly looking for new ideas. The development of personal computer technology revolutionised the field of market research from the 1980s onwards, both in the collection of data from consumers and in its analysis and interpretation. While the focus of any discussion of Alan’s work is bound to be his visionary use of new computer technology from the early days of personal computing, one of his gifts was his ability to marry this complex technology with more conventional market research approaches. He put together information obtained directly from consumers about their preferences and buying habits and used this as a sound basis for his modelling of markets. Alan’s technology-enabled behaviour to be predicted far beyond consumers’ ability to articulate their choices and reasons for them. Alan worked initially with individual clients, of whom I was one while working for Unilever in the early 1980s, but his approach then lent itself to multi-user systems which modelled an entire consumer universe, such as personal finance institutions. These enabled clients to understand (through online market simulations in the model) how buying intentions were likely to vary with changes in consumer attitudes brought about by, for example, advertising and product development. Not only did the clients understand the likely effect on their share of the market, but the models provided detailed information as to where share would be taken from or lost to in the face of consumer attitude changes. I met Alan during the 1970’s when I was working in Sweden and then in the UK before eventually returning to Australia. Our paths initially crossed in Brussels in 1973 at the ESOMAR (European Society of Opinion and Market Research) conference where Alan presented his ideas on ways in which people think and behave in relation to defined products and services. Alan informally referred to his technique of forecasting the effect of product differences on consumer behaviour as ‘Midas’ and he often joked that it would turn ideas into gold. To the many international market research experts present at the Brussels meeting Alan was well known for his far-sighted approach to the measurement of customer preferences with the marketing of major consumer brands and for his close connections with McCann Erickson with whom he was affiliated. Alan was able to enlighten us on how people think and why they do so in relation to their intention to purchase or use a product. At Brussels, I was one of many vying for Alan’s ear to seek his advice on how to increase the value of advertising and sales promotion for successful marketing of global brands. After that first meeting, Alan and I worked on several pharmaceutical product strategies with remarkable success. Through Alan’s work, we were able to gain insights into the mind-sets of doctors’ preferences that offered ways to design targeted strategies and thereby maximise promotional impact. Reflecting on all this activity now many years later it becomes clear that we became infected by Alan’s creativity and brilliance as much as his ‘Midas’ technique. Alan inspired and tested us as he anticipated how customers’ mind-sets would change in response to alternative strategies. And he was mostly right. From a myriad of scenarios with multiple alternatives, Alan could distil complexity into simplicity. We reasoned that if his ideas were good enough for Unilever, Coca-Cola, Nestlé and other major brand owners, then we would at least be in good company. Of course, the key to Alan’s brilliance was not just his data or the crunching of numbers. Much of it was Alan’s overwhelming enthusiasm, his charming persona, his incredible intelligence and his breakthrough directness when things got tough through exasperation with so many complex issues being juggled in different directions. Alan was an innovator in so many ways. When I left the UK in the late 1970’s Alan was already years ahead of the digital era with further computer applications that he affectionately still referred to as ‘Midas’. He was also among the very first to use hand-held input devices in the field, to crunch data on site and to conduct computer-aided interviews. In later years I understand Alan worked on more advanced marketing and consumer behaviour techniques both alone and in collaboration with others. As computers changed from being hugely expensive and inaccessible machines to nimbler self-programmable micro-computers, Alan was right there in forefront already applying his ideas into how to use the latest PCs for complex tasks related to his work. In this regard, he was an industry first. The period I have described during which Alan and I worked together in the UK was during the 1970’s, now over 40 years ago. Alan was born in Liverpool in 1932, he attended university in both Liverpool and London and graduated with an Honors Degree in Psychology and was subsequently awarded a Post-Graduate Diploma in Clinical and Educational Psychology. Alan said once that he had considered an academic career in psychology but that it would be too boring for him. Instead, his strong interest in human perception and its relationship to behaviour steered him towards advertising assessment and finally to his own consultancy from 1970 until 1992 when he retired due to ill health. Alan was an early adopter of the Apple II microcomputer. He instantly appreciated that it could meet his requirement for a number of his market research-based tasks, he was fortunate in that he had met Ray Poynter, who at the time was a statistician and had also developed a passion for computer programming. It was I believe thanks to Ray’s statistical and programming abilities that some if not all of Alan’s pioneering ideas were able to become a reality. At the time the limiting factor with microcomputers was related to the storage and retrieval of the collected data (initially about 140KB using a floppy disk). Fortunately, a company in the United States (Corvus Systems) introduced a mass storage device for the Apple, initially offering around 10MB of Winchester disk fast storage. Later products increased storage capacity and the ability to daisy chain drives and a rudimentary networking protocol allowed the mass storage to be shared by a number of computers. 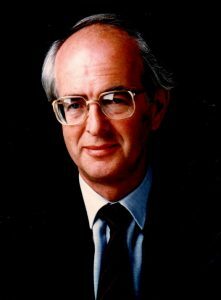 Alan was an early adopter of hard disk storage and was, therefore, able to store and process relatively large amounts of data that he had collected via his computer-aided interviewing. Within a short period of time, Alan was operating in Europe, Japan and the United States. In order to keep up with the ideas presented by Alan, Ray built up a support business to meet Alan’s software and data processing requirements, recruiting programmers that had the skills to produce bespoke software for data collection and modelling. Fortunately, Ray was also a visionary so Alan and Ray could bounce ideas around and propose ideas, some of which were highly innovative and at the time were way in advance of what the rest of the market research companies were using. I would have said that the future for Alan Frost and his computer-aided interviewing and data modelling was guaranteed but unfortunately events beyond anyone’s control took over. Alan suffered a major stroke in 1989 which although not badly affecting his mobility had a significant negative impact on his business. Senior staff tried to step up to the mark but unfortunately, none had the unique combination of skills required, so inevitably the company was sold. Most of the skilled people that Alan had brought together migrated to other roles within the industry. This Article is dedicated to Alan’s wife Barbara and their two daughters Belinda and Amy. If you too worked with Alan and would like to add your comments, please feel free to do so.